The main designs in this collection are nearly finished and I wanted to share another stitch out with you to show you a completely different look that can be achieved with these designs. As I have created them for light coloured fabrics I embroidered one of the designs on dark red silk to see how that would work. The first colour way was stitched in Sulky Rayon 40Wt True red 1039. It didn’t show very well so a darker shade may have been a better choice. I have to confess that this photograph does not show the fabric shade correctly. Reds always seem to be difficult to catch accurately on camera. Then I did the scrolls in Temple gold 1159 but noticed that the red fabric gave the gold a green tint. This is not very clear in this photo. You need to be careful when embroidering on dark fabric as colours can appear quite different. I forgot to change my bobbin thread to black and noticed a little show through of the white bobbin thread especially on the little stars. The decorations which are little baubles and tiny stars were done in a dark red but I should have done them in metallic thread so they stand out! 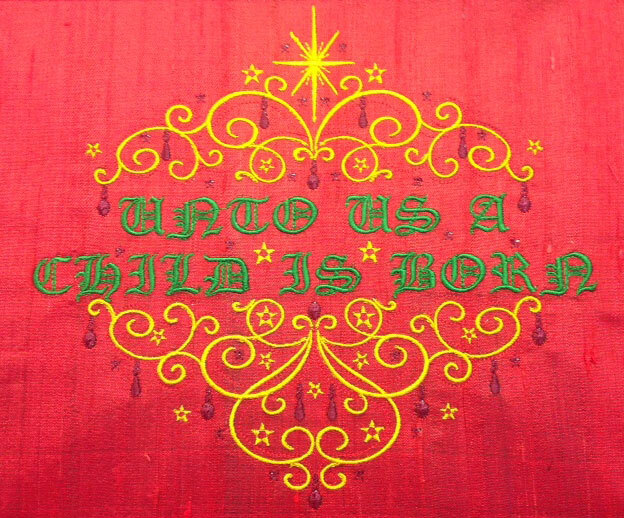 Finally the text “Unto us a child is born” is embroidered in 1051 Xmas Green. This was a valuable exercise and I suggest that you test your shades especially if you using dark fabric. 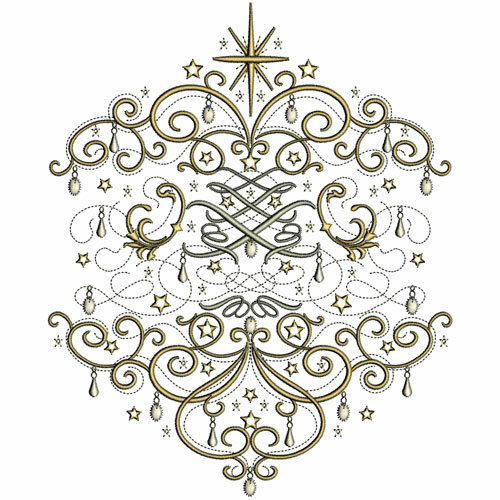 There are eight designs which have Christmas messages that are stitched over a Christmas tree shape consisting of scrolls and swirls, decorated with tiny baubles and stars. The set also includes another eight messages with scroll work and decorations above and below the messages. I have just completed a final design that incorporates many of the decorative elements without a message. Hope you like this one. Imagine seasonal cushions with this design embroidered on each one and carefully decorated with metallic threads and crystals. Perhaps contrasting bands of fabric each side and some piping would add more opulence to the cushions covers. Thank you to those who made suggestions for messages for this collection. Before I release these 18 designs I just need to stitch out this design above and check it again, so I imagine that the set will be released on Monday, 1st December now. You can pre order the set now for $15 if you are a Member of my Embroidery group and it will be available at an introductory offer of $20 from Monday for 2 weeks. These are large designs requiring an 8″ wide by 12″ hoop so they are not available in all formats. I have been asked to create some for smaller hoops. After Christmas I will see if it is possible to split these for large hoops, say 10″ by 6″ hoops. This entry was posted in Discussing machine embroidery, New Designs and tagged Christmas. Bookmark the permalink. They’re beautiful, Hazel. They’re also another reason why I need a machine that embroiders larger designs. Yes despite all the developments and features on new embroidery machines the 8″ wide hoop is in my opinion the best! It opens up so many more possibilities in machine embroidery. My favourite hoop is the 8″ square hoop that holds the fabric perfectly giving the best hold of your fabric and stabiliser all round. I have sent you an email about Pre ordering but am not sure if it went through as it bounced back.